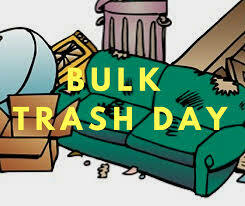 The City of Glen Rose will be providing free curbside collection of bulky items on Monday, May 13th. To participate please call City Hall at 897-2272 or contact Utility Billing Clerk Gutierrez at the e-mail link listed at the bottom of this notice by the end of the day on Thursday, May 9th. We will need your name, address, phone number, and a list of the items you intend to set out by the curb for collection. Depending on how many city residents participate, it may take several days to complete the effort. Please make sure the items you plan to set out are included in the following list of “accepted” items. Items accepted: All types of refuse and wastes that would normally be associated with maintaining a residence, such as chairs, tables, couches, lamps, stereos, televisions, old clothing, boxes, etc., water heater, clothes washer/dryer, dishwasher. Grass trimmings, leaves and debris bagged in no bigger than a 30-gallon trash bags. Brush must be bundled no longer than 4 feet in length and 3 feet in diameter.